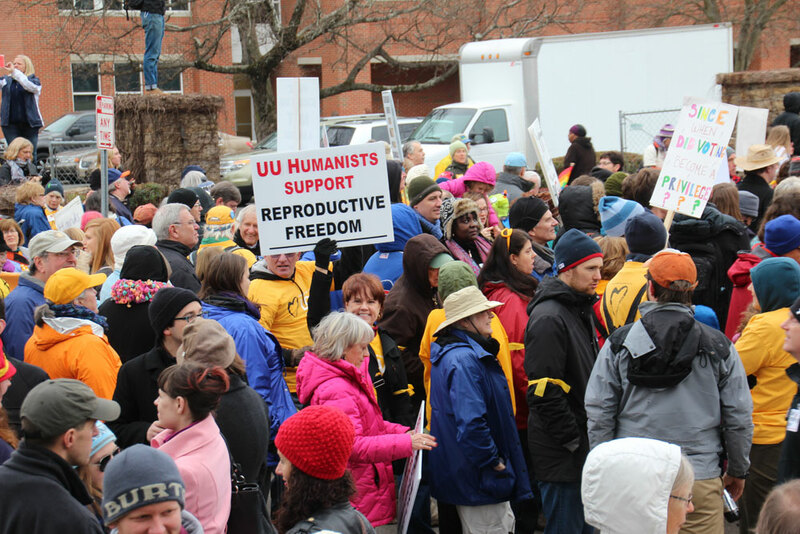 John Hooper and Pat Mohr, president and vice president of the UU Humanist Association, attended the Moral March on Raleigh event on February 8, 2014. In the picture on the right, they are standing with Mike and Susanne Werner, fellow UU Humanists and secular activists. The march brought together approximately 80,000 people from around the country, including UUA president Peter Morales and over 1,500 other UUs, many wearing their bright yellow "Standing On the Side of Love" t-shirts. They came to Raleigh to protest regressive North Carolina GOP policies around health care, education, the criminal justice system and voter suppression that especially disenfranchise the poor and people of color. This article was originally published in the Humanist Network News. HNN is a weekly news e-zine of the American Humanist Association with a circulation of around 44,000. UUHA president John Hooper recently participated in the Secular Leadership Summit, on January 25, 2014. The event was held in Columbus, OH and was sponsored by the Secular Student Alliance. This meeting, formerly known as the Heads Meeting, brings together the leaders from all of the major non-theistic organizations to discuss strategy and to coordinate activities.